So as you probably know by now, we’re taking this competition incredibly seriously, and people will probably start calling for Shin Tae Yong’s head if we don’t make it to the top 3. The success that was the 2012 Olympics is probably one of our fondest memories as a KNT fan, and to be honest the talent of this team is not far behind. In 2012 we had a somewhat in-form JSR (as in he didn’t make any stupid mistakes and even saved a penalty from Aaron Ramsey), a defense consisting of YSY – HSH – KYK – OJS, a midfield of PJW – KSY, and an offensive four of JDW – KJC – NTH – PJY. This time around, we don’t have a Ki Sung Yong, and we don’t have an in form Park Ju Young. Which you had to admit was really fcking good. But. This time around I honestly think we have a comparable defense in Shim Sang Min – Yeon Je Min – Jung Seung Hyun – Lee Seul Chan. All four of them got more than 1000 minutes in the K League, except SSM due to injury, and YJM – already an established starter for Suwon with 22 apps – is looking like yet another rock solid CB captain a la Jang Hyun Soo and Lee Sang Min. Midfield? I’ve had many people tell me that I’m crazy to believe that the talent this time around is anywhere near the talent we had in 2012. But I honestly am more excited for the 2016 team than I was for the 2012 team. Here’s one way to put it: the difference is raw talent vs established talent. Ki Sung Yong and Koo Ja Cheol had a ton of experience. Ji had come off a bad season with Sunderland but he was scoring left and right for the KNT. NTH and PJW didn’t have much KNT experience but NTH was coming off a decent first year with Lekhwiya and PJW was doing very well for Olympic qualifying. So herein lies the difference: established stars who we know can perform, vs. hot talents and sort-of established K League stars who we know can wreck Asian opposition but have not been tested on the world stage. Now yeah they did very well in the 2013 World Cup when they narrowly missed out on a semifinal berth due to penalties, but the U20 stage and the U23 stage are completely different beasts and can’t really be compared. I more confident about this team’s prospects if it wasn’t for one key issue: the injury of Lee Chan Dong. Now, LCD was a fairly unknown player until this year when he tore it up with Gwangju. 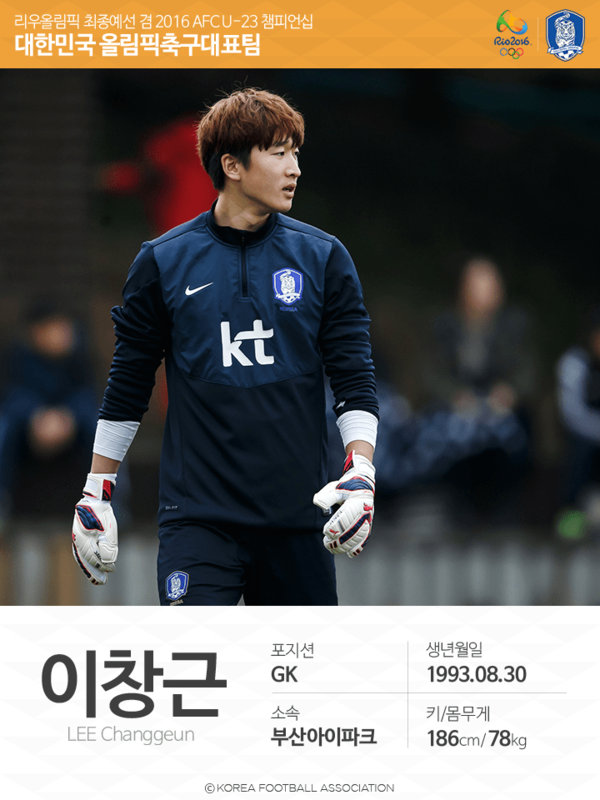 He played for Incheon University until 2013, when he was drafted into then-K League Challenge side Gwangju FC. He had a great 2014, and an even better 2015, which saw him introduced to the U23 KNT for the first time, and he quickly became the go-to defensive midfielder. With Lee Chan Dong injured, the defensive midfielders left are 21-year-old Park Yong Woo of FC Seoul, and university player Hwang Ki Wook. I don’t know much about HKW, but I know that Park Yong Woo, who started 21 games in his first season with FC Seoul, is a decent alternative after a nice performance vs Colombia and China in that 4-nations tourney China held. Shin Tae Yong seems to want to either play Park Yong Woo or Lee Chang Min in the Lee Chan Dong role in a 4-1-4-1 / diamond 4-4-2 or a 4-2-3-1. GK: I’ve said this many times but we are STACKED in this department it’s not even funny. Kim Dong Jun. It means a lot that this young, just-turned-21 year old could displace the captain Lee Chang Geun. He really does prove his worth on the pitch though, though he has yet to feature for this team in a major competition. If you’ve seen any of the random friendlies this team has played (vs. Brazil, vs. Tunisia, etc.) you’ll notice how good this guy was (note: I actually only watched those two games and from those two games I was like “oh so this is why he displaced LCG…”). 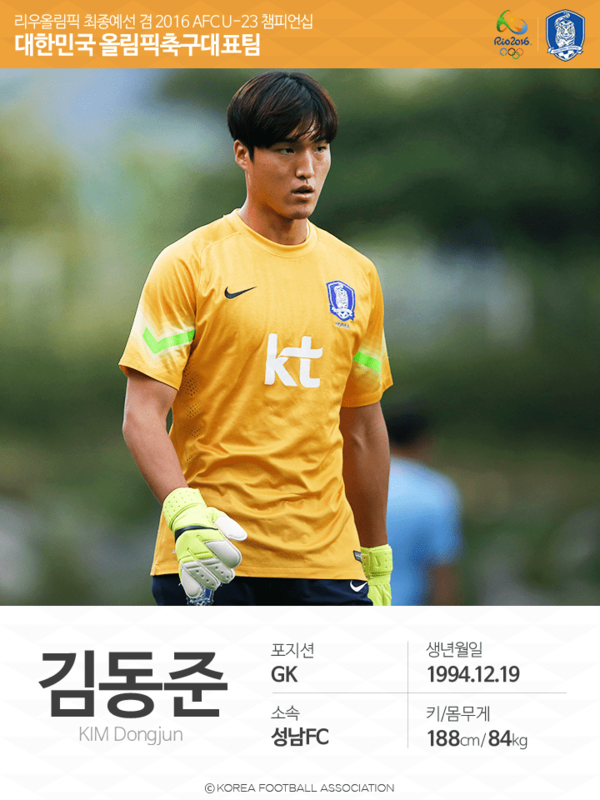 KDJ has recently transferred to Seongnam and I am very interested to see if he will displace Park Jun Hyeok, a solid goalkeeper in his own right, as well. Then there’s Gu Sung Yoon, Cerezo Osaka’s young keeper. Have I ever seen him play? No, but I’ve heard he’s been fantastic for Cerezo… so there you go. Three wonderful keepers. When have we ever had this much GK depth in the youth setups? DF: In defense we have the familiar faces: SSM, YJM, and LSC. Expect all three to start. Now, there’s a bit of a question mark when it comes to captain YJM’s CB partner. The good news for Shin, who led Seongnam Ilhwa Chunma to the 2010 AFC Champions League title, is that there is plenty of attacking options in his squad with Jeong Seung-hyun, Kim Seung-jun and Moon Chang-jin all notching two goals each in the qualifiers. We also have Gu Hyun Jun and Park Dong Jin, who play for Busan and Gwangju, respectively. They’re not quite as familiar names as say Yeon Je Min, but they did a solid job during the qualifying campaigns and fully deserve a place on the team. The only newbie here is Hwang Ki Wook, a university player selected due to the injury of Kim Min Tae (CURSE YOU INJURIES although tbh KMT was a disaster at the 4-nations tournament in China). HKW is also able to fill in as DM, which is certainly useful given LCD’s injury. But let me fill you in on some less familiar names. Yoo In Soo is a 21 year old who just signed for FC Tokyo (dammit). I’ve never seen him play so I can’t comment on his abilities, but he did score twice in a warmup game vs Gwangwoon University. Lee Young Jae you probably have heard of, as he’s either an occasional starter or the go-to super sub. He plays for Ulsan along with Kim Seung Jun, and even scored his debut goal not so long ago in late October. 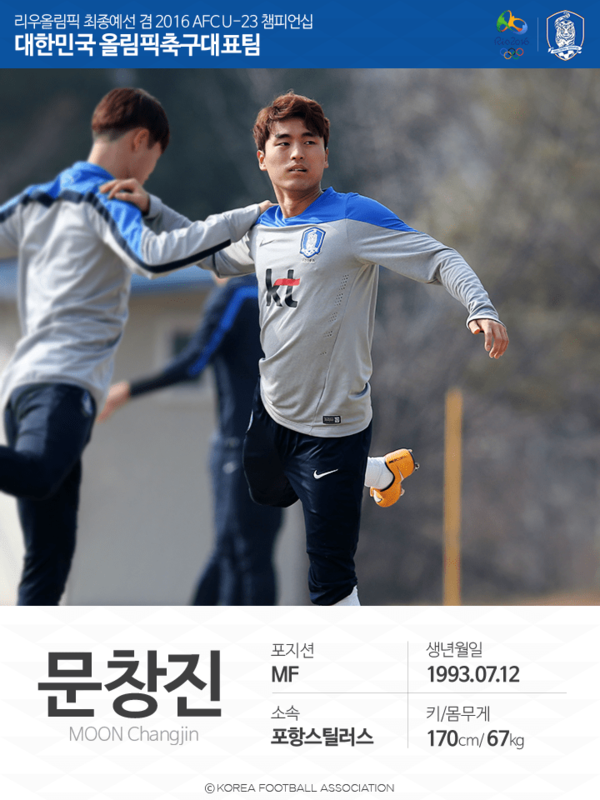 Now, Kang Sang Woo is a player who hasn’t been on the team for a while (because he hasn’t really broken into the Pohang first team yet) but is a VERY familiar face – he started most of the games in 2012 and 2013, and even scored some important goals along the way. I expect him and Lee Young Jae among the frequent subs. FW: Oh boy there are so many question marks about this position. Ever since 2012, actually, this team has struggled a bit in the FW department and has largely relied on the midfielders (read: Moon Chang Jin) for goals. Kim Hyun is good, but it ends there – he hasn’t shown anything special. 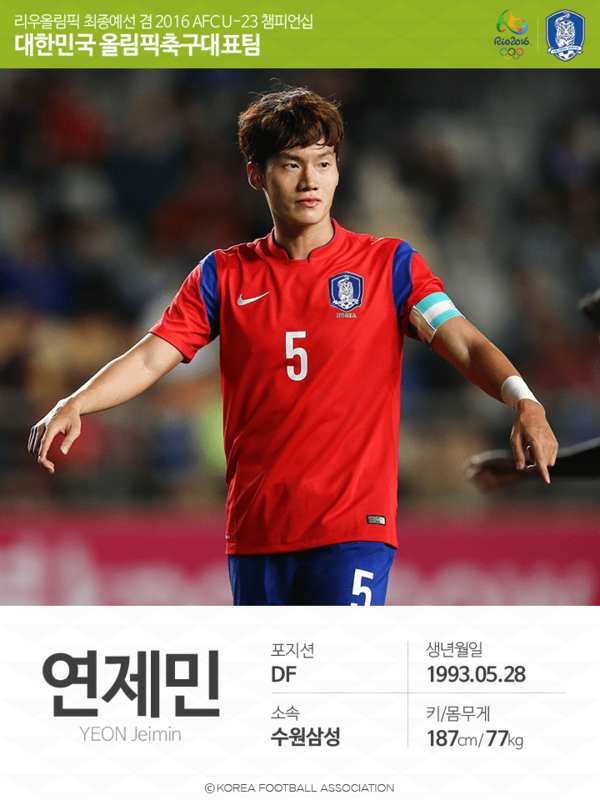 Hwang Hee Chan, the hot star from the incredibly unfortunate 2012 U16 tournament who caused controversy with his move to Europe, was drafted into the team (even though he’s only 19) due to his form with Liefering. He showed good form in the friendlies vs. Australia, but is a 19 year old good enough to fight against 22/23 year old defenders? My biggest question is why Cho Suk Jae, who had played very well during his loan spell to Chunju Hummel, wasn’t called up, but I trust Shin Tae Yong when it comes to player judgment so I won’t question it. 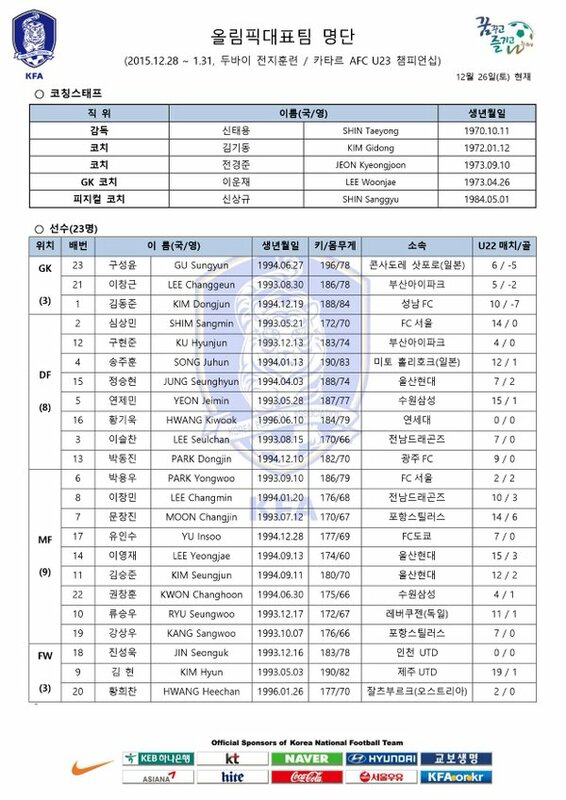 Now the other striker on the list is Jin Sung Wook of Incheon United. He scored 4 goals this season and was recruited last minute as Park In Hyeok’s replacement (since FSV Frankfurt didn’t let him come to the tournament), with his only experience with the team coming from a Jeju training camp. I think I’ve seen him play one game, so I won’t say anything about his attributes/abilities, but I suspect he will see limited playing time at the tournament. Either KH or HHC should be the starter, and I’m actually not sure who will (I just hope it’s not both).